"Great for leftover ham. This is easy to make with ingredients you probably already have in the kitchen. Try adding peas or other vegetables, if desired." 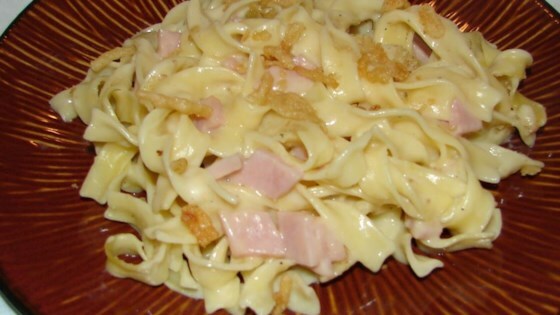 Place the noodles, ham, cheese, soup and milk in a 9x9 inch casserole dish and mix well. This was EXCELLENT! I added some chopped onion and some garlic powder. I will make this every time I have leftover ham! Thanks for sharing!!! Very good recipe to help use up some leftover ham.